Back in 2005 I wrote Welcome to America, It Will Only Cost You a Leg , about Moises Carranza-Reye, an immigrant from Mexico who came to Colorado looking for work. He ended up in a county jail on an immigration hold, where he lost a lung and part of a leg after developing a streptococcus infection. He sued in federal court, and today his lawyer announced a settlement. Carranza-Reye will receive 1.5 million dollars. Park County Jail...houses alien detainees under a contract with U.S. Immigration and Customs Enforcement (ICE).....[It] takes in immigration detainees and overflow inmates from other counties and the state prison system, charging $45 a day per prisoner; "This jail is a revenue-generator for the county," says Colorado Springs attorney Lloyd Kordick. "They're actively advertising for customers. They're also trying to minimize their costs, and they really didn't care about the consequences." 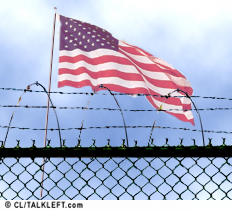 Among the provisions of the compromise immigration bill is one calling for the building of more detention camps. SEC. 137. INCREASE OF FEDERAL DETENTION SPACE AND THE UTILIZATION OF FACILITIES IDENTIFIED FOR CLOSURES AS A RESULT OF THE DEFENSE BASE CLOSURE REALIGNMENT ACT OF 1990. (1) IN GENERAL- The Secretary shall construct or acquire, in addition to existing facilities 1 for the detention of aliens, at least 20 detention facilities in the United States that have the capacity to detain a combined total of not less than 20,000 individuals at any time for aliens detained pending removal or a decision on removal of such aliens from the United States subject to available appropriations. I'll be commenting on other provisions as I read through them.